The Hackney originated in and around Norfolk, England, by prosperous farmers seeking to improve the quality and trotting speed of their carriage horses. Around 1760, an existing local breed, the Norfolk Trotter, was crossed with Thoroughbred stock, and over the next 50 years the Hackney was developed as a distinct breed. The breed flourished in Britain throughout the 1800s due in part to the emphasis on swift, light carriage, and riding transport, and by 1878 the Hackney had found its way to the United States. The modern Hackney horse stands over 14.2 hands tall, with the ponies ranging from 12.2 hands to 14.2 hands in height, and they can be black, brown, bay or even occasionally chestnut in color. The Hackney’s hallmark is its highly distinctive action; trotting fluidly with high knee and hock action, the Hackney exhibits extreme brilliance. Hackney ponies are divided into four competitive categories: the Hackney Pony; the Harness Pony; the Roadster Pony; and the Pleasure Pony. 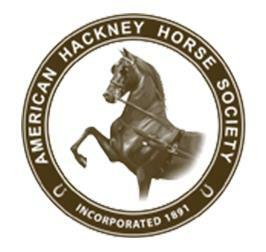 The Hackney Horse, like the Hackney Pony, is a versatile performer that excels in carriage and combined driving events, as well as in the show ring, both in harness and under saddle. It exists to maintain a current registry of the Hackney; to compile and publish a stud book of the Hackney horse and Hackney pony; and to ensure the proper transfer of the certificate of registration. It endeavors to promote the breeding of quality Hackney horses and Hackney ponies; to create interest in the breed; and encourages exhibitors to support horse shows by showing their Hackneys in classes offered.